I have a granny bag. She's a Marks and Spencers wonder from around 5 years ago who I pointed out to T while we were shopping for Christmas presents. He looked bemused by the concept of a 20 year old girl willingly carrying around something a pensioner could feasibly keep her knitting in and went for a benign but quizzical eyebrow raise saying 'Really?!'. Not wanting to ruin my lucky streak of having got him into the building - cajoling T into M&S is a task in itself given the childhood memories he has of his Granny dropping her skirt in the middle of the shop floor to try things on - I didn't push the issue and we shuffled off to buy the requisite tins of Christmas biscuits that go down so well with various Uncles and Aunts. 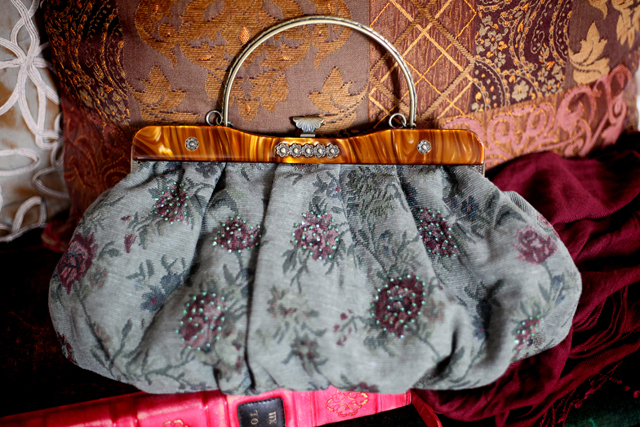 We trudged back to the flat laden with shopping and I found myself wishing I'd bought the bag. Don't you hate that feeling? A busy month of essays to be handed in before Christmas break, lots of extra shifts at work and plenty of yuletide fun then wiped her from my memory so that when I opened up the box of Shreddies (Christmas tradition of disguising presents in empty boxes before wrapping them) and pulled out the carpety bundle of joy she was a complete surprise. Poor Vera, I'm sure if she had a name it'd be Vera, then languished still stuffed with 'new bag' stuffing in my wardrobe for a very long time. There was a failed attempt of taking her out for a jaunt to see Avatar at the cinema but it turned out that wasn't her sort of film. In fact it wasn't until the weekend before last when I needed something to complement a brown-based outfit that she was finally put to proper use for the first time. Needless to say she pulled off her maiden voyage beautifully and then spent the entire weekend away on my arm regardless of whether she matched. you must've posted this just as I waslogging in.it was fate (0: Vera is lush! she looks quite 20s/30s era & yes shes a granny bag but shes ace! you need to do more posts like this one,your writing is so nice to read.how are you not already a professional writer?! That story of yours made me laugh :) Especially the "benign but quizzical eyebrow"! Vera is definitely granny but very much 'on trend'. Love it! Haven't seen that one before - is it really M & S?? Before long you and Vera will be completely inseparable, and you'll be dropping your trousers in M&S while she watches on, completely unfazed. I love your writing style too, you could write a brilliant 'Beautiful Clutter' column, with the addition of your photographs it'd be a wonderful addition to a vintage style publication. Vera is lovely and should be showed of on lots of occassions.